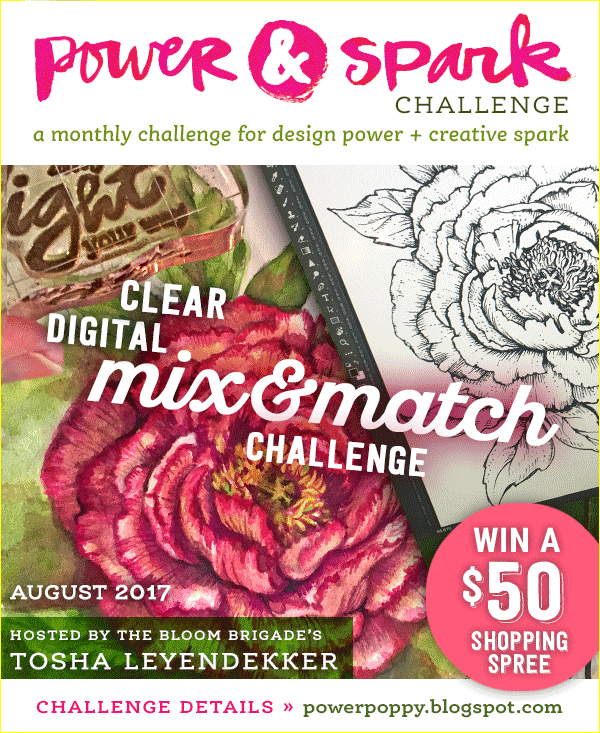 We’ve got a brand spankin’ new challenge at Power Poppy this month, and our hostess is the lovely Tosha. It’s a fun one called Mix and Match, where you’re invited to combine Power Poppy stamp sets. You can mix digital sets together, clear sets, or get really crazy and combine digital sets with clear sets. It’s a fun way to stretch your creativity further, and also see how you can stretch your stamps by using them in different ways. I chose a really simple way to mix and match since I already had one of the pretty cloches culoured up from our new set called Under Glass. 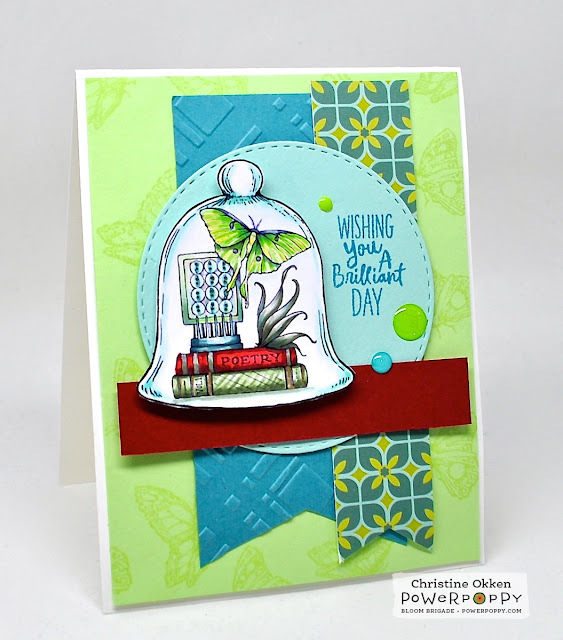 It has a pretty luna moth, button card and a cute stack of books. When I was colouring it I knew I wanted that luna moth to be a bright green, and then when I got to the books I decided to really go a bold direction and make one of the books deep red. So, for the Mix and Match element I used the butterflies from Power Poppy’s set Pure Prairie Spirit to stamp in the background. Even though they’re not moths, they’re still fluttery so I thought they would work, as well as the sentiment from Pure Prairie Spirit. I used an embossing folder to mimic the pattern on the green book, and the red horizontal stripe of card stock matches the red book. So, its a little bright and not quite what I usually do with the unusual mix of colours, but all in all I think it’s a cheery card. A couple of enamel dots finish it off and below are the collection of Copics I used. Another card where I coloured when I was visiting my mom and dad. Don’t forget that if you play along and win it means a $50 Gift Certificate to the Power Poppy store! Here’s the Bloom Brigade bringing you inspiration today! Christine, I so love your cards, and I admire how you make use of the creative gifts that God has given you. You have been instrumental in instilling courage in me to incorporate more flowers and lovely things in my cards. Thank you for sharing the results of your creativeness with us all. There is one thing I really have been missing in your blog. In the past I loved to read all about your family and your ministries. I miss all those entries that made me "friends" with you all. I'm sure your time for doing that is very tight. I just wanted to let you know how I miss it, though. It's always a treat to come see what you've created, Christine. I love how you play with color and papers, not to mention your stellar coloring, which I certainly have mentioned plenty of times and it bears mentioning again -- fabulous coloring! 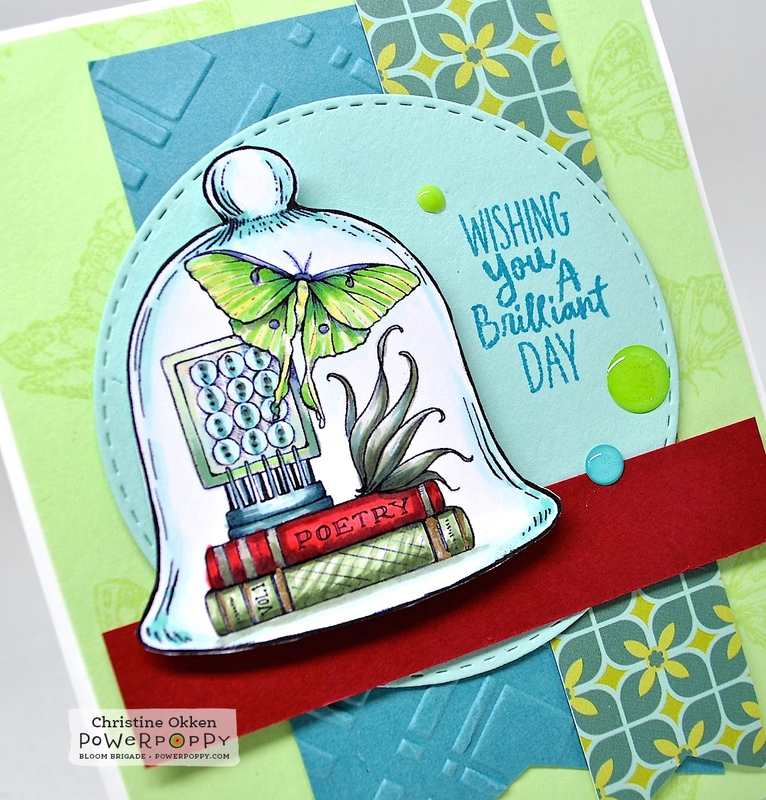 How beautiful, Christine, and I LOVE how you've used the DP colors so beautifully in your image! It is so precious, and your coloring is amazing! I love the layout with the enamel dots and the popped levels and embossing. Beautifully done, as always! Hugs!